Width of pillow form. The finished pillow will be slightly smaller in width. Length of the pillow form. The finished pillow will be slightly shorter. Pattern runs on the pillow length (as illustrated above). 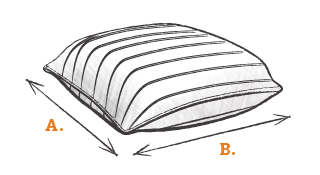 Pattern runs in the pillow's width direction.